It's more interested in getting you to practice your downward-facing dog pose than in monitoring your next five-mile run. Name an article of clothing, and some company has probably crammed a fitness tracker into it. We've seen connected shirts, shoes and even bras. But most of these focus on the time you spend active -- steps walked, distance ran, stairs climbed and so on. But while keeping track of your exercise helps create a picture of your health, it's only half the image. What you do and how you feel while resting is also important. 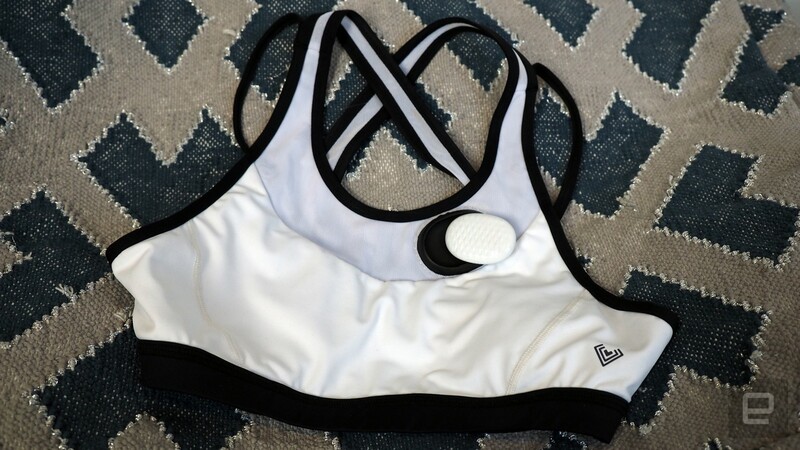 The Vitali is a new sports bra hitting Kickstarter today that focuses on the other side of your well-being, keeping track of your breathing, posture and heart rate to help you maintain that yoga-like calm on and off the mat. Vitali creator Cindy Yu turned to yoga to help deal with her depression and, while it certainly improved her mental state, it was still too easy for her to lose that center over the course of her everyday routine. Work, school and other issues can wear us down, and we may not notice the toll they take until it's too late. So Yu developed Vitali to do the noticing and remind her when she needs to step back for a bit, as well as how anxious she is overall. After all, it's okay to be stressed once in a while; it just can't be your constant state of being. A sports bra was chosen for comfort and flexibility -- it can be worn under both normal clothes and gym clothes. There are three sensors in the fabric of each Vitali bra that are waterproof, not just for sweat but also so you can just throw the whole thing in the wash. But most of the monitoring work will be done by the device you insert at the top near your clavicle, dubbed the "gem" for its shape and diamond pattern. The gem is decidedly not washable, and so it's easily popped in and out of the bra. This also makes it rather affordable to buy multiple bras, swapping them out when they get dirty or when you just want a different color. The ones I saw were white, black or pink -- I'm partial to lighter colors that won't show under my clothes, but other women might prefer something more striking. The gems themselves will be available in black or white. 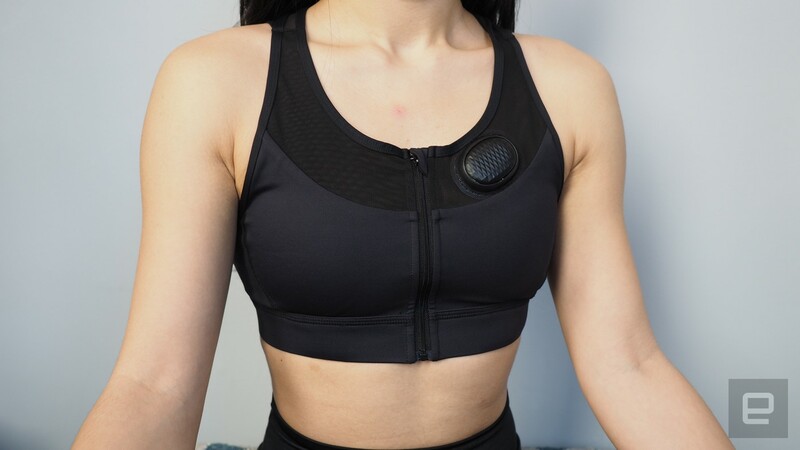 The bra will track your heart rate variability and breathing to keep tabs on your wellness, while the built-in gyroscope and accelerometer help monitor the position of your spine and pecs to make sure you're maintaining proper posture. If you're slouching or hunched over, the gem will give you a gentle buzz to remind you to sit up. Of course, any connected device has to send that data somewhere, and the Vitali app for iOS or Android will pull it all in and help you make sense of it, even assigning a "wellness score." Like other fitness apps, you can also set goals for yourself, though not in common metrics like active minutes or miles traveled -- more about how calm you are and how much you slouch. And if you're not the type to close your eyes and imagine a white ball of healing light to meditate, the app is also a good point to focus on in itself, giving you immediate feedback on your heart rate and breathing via white lines on warm orange and pink backgrounds. Anyone looking to make their next yoga session a little more connected will have to wait for the Vitali to ship in February of next year. But you can lay down the cash now over at Kickstarter -- early birds can get in at $129, way down from the retail price of $249. If you're really serious about getting your fill of good vibes and chill, there's a $2,499 tier that will net you a relaxing vacation on Vancouver Island with yoga, meditation and even some surfing. Just don't forget your smart bra -- after all, you want to know exactly how relaxed you are at the end of the week.